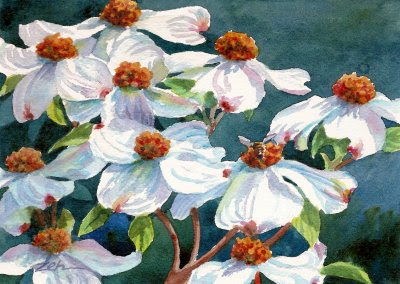 When the spring sun shines brightly on white Dogwood Blossoms, they seem lit by a heavenly light. I am fortunate to have a large dogwood at the edge of my yard. It was growing wild when the property was cleared for the house. As it is native, the only maintenance it needs is to trim back the pine tree growing behind it to give it headroom. So every so often, I send one of my boys up the pine with a saw to trim off a branch or two. Look closely and you'll see a honey bee filling up on nectar and pollen from one of the blossoms.